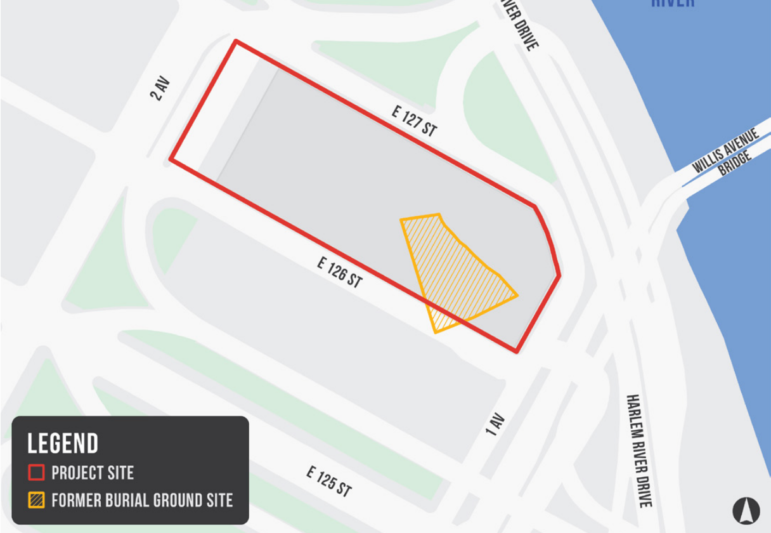 The Economic Development Corporation (EDC)’s proposal to rezone the 126th Street Bus Depot to facilitate the development of an African Burial Ground memorial and a mixed-use development with housing was approved unanimously by the City Planning Commission on Wednesday. The project, which was earlier “approved with conditions” by both Community Board 11 and by Manhattan Borough President Gale Brewer, now moves forward to the City Council, which will deliver the final binding vote. EDC’s plan comes after years of work by two task forces of local stakeholders, who sought to honor a desecrated burial ground for enslaved and free African remains discovered at the site. The plan has also figured into discussions of the immediately-adjacent East Harlem rezoning, as it’s one of a few large parcels that the administration has deemed ripe for redevelopment and that is also city-owned—meaning that the city can control what is built there. The city’s plan would create an outdoor memorial and indoor cultural center, commercial space and roughly 730 units of housing. The city has committed to ensuring 20 percent of those units are targeted to households making less than $25,770 for a family of three, and another 30 percent are targeted to families making no more than $68,720 for a family of three. No developer or exact site plan has yet been chosen, but in one scenario the city imagines a 19-story and a 34-story building. EDC and the Department of City Planning (DCP) have agreed to establish an urban design review protocol that will allow the chair of the commission (also the executive director of DCP) to inform the development and design of the project, assuming it receives the City Council’s approval, and to ensure the commission’s goals for the site are realized. In the past, some community residents have expressed an eagerness for the memorial, but concern that the new buildings would overshadow the memorial and that the housing wouldn’t be affordable to enough East Harlem residents. Both the board and the borough president requested in their conditions that the city make 100 percent of the units affordable by securing additional funding, provide preference for a non-for-profit developer, and make sure the developer follows the task force’s design recommendations for the design of the site, among other recommendations. Excited that the project is moving forward? Disappointed that it hasn’t been stopped in its tracks? Let us know what you think and we’ll post your comments below. As being a part of the Taíno people, I feel that the history of both the Lenape people and African American Slaves should not be over looked. I also feel that any housing built there should be 100% affordable housing for people in the community. I’ve lived on 126 street for over 30 years and my family more. The coming of The African Burial Memorial is wonderful news. However the high rise buildings are not so welcoming. As a resident living across the street from the bus depot, I would love to see a playground sharing the space with the Memorial. Many years ago the park on 127 street ( with the CRACK IS WACK mural) use to be a playground with swings, climbers, picnic tables, a sandbox, handball and basketball courts. We use to play there as kids, that was our neighborhood park. That was all removed. What remains is the basketball courts. Some parts of the park was being used for storage of materials from DOT. Today the children on 126 street don’t have a playground nearby to play safely in. We need a playground sharing the space with the Memorial. A playground with bathrooms, swings, a climber, courts, picnic tables, tress, water fountains, a fountain. It would make the community look more surburban. The African Memorial and a playground would be a gift to our community. The recommendation is non-binding and doesn’t kill the proposal, but sends a strong message of disapproval. Most of those who testified said they generally supported the De Blasio administration’s proposal to rezone downtown Far Rockaway, but asked for changes to ensure the plan truly benefited the area’s existing residents.